I’ve never judged History Day before. Is that okay? Absolutely! We welcome veteran judges as well as new judges. Every Contest begins with a training session run by the Virginia Museum of History & Culture. Judging teams will consist of a mix of veteran and first-time judges. What qualifications are needed to be a History Day judge? No qualifications are required to judge a History Day event. However, judges should possess an interest in history and be comfortable interacting with students. Judging involves evaluating projects with a critical eye, making decisions and offering students constructive feedback on their work. At both the District and State level, a judging session typically requires a minimum of 6 hours. This includes an orientation followed by examination of student work, interviews with students, and determination of top entries. Judges who review Historical Paper and Website entries have a slightly different schedule with a similar time commitment. As a judge, we’ll invite you to participate or view a few webinars before the competition, but they aren’t required. What do judges do during History Day? ​The basic task of judges is to evaluate the students’ entries and provide both the positive and the constructive feedback that is essential to the learning process. 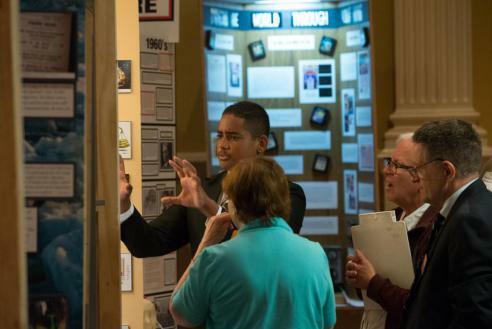 Judges begin the day with an orientation where they review the day’s timeline, learn how to use the National History Day scoring sheets, discuss consensus judging, and meet their fellow judges and judge captains. There will be time for questions and answers. Judging teams will consist of two or three members, with a mixture of veteran and novice judges. Judges evaluate the student entries in 10 to 15 minute intervals, with time to interview the student(s) about their project. Judges fill out the score sheets and come to consensus on the winning entries. You are welcome, but not required, to stay for the Awards Ceremony. What kinds of questions should I ask the students? Questions asked during the judging process should give students the opportunity to talk about what they learned while creating their project. The Contest is the students' day to shine! The judge should never talk more than the student or make them feel as though they have not done enough research. Questions about their research process, sources used, inspirations for the topic, and what they liked about the project are all appropriate questions. How do I sign up to become a judge? To sign up to be a judge, please click here and register. If you have any questions, please e-mail Christina Vida at cvida@VirginiaHistory.org for more information.